MMS/CD is a vast world, and while not really all that complicated, one needs to be aware of all the details if they hope to use it to recover health. Many people want the gist of this protocol or that protocol. Well, giving bits and pieces of a protocol here and there, is a great dis-service to any sick person. The truth is, usually you need more than just one protocol to get well, and most importantly, you need to know other important details—the do’s and don’ts, to get the benefit of the protocols. Good health is serious and for optimum health recovery you must have the complete picture…or at least as much as is presently possible. We simply cannot put all the information here on this website. We work with over 50 updated tried and proven protocols, including some key tips and secrets for all those who wish to recover their health from most illness and disease and/or learn about prevention and longevity! You may already have Jim's Guidebook, but still need personal guidance and support. That's what this group is about. We'll teach you how to use CD to restore your health from most diseases...from HIV/AIDS, Diabetes, MS, herpes, Parkinson's, Alzheimer's, Lyme Disease, Cancer, etc. We'll even teach you how to use CD to protect and support your animals and pets. Do you have a wound that has been difficult to heal? CD is not a 'one size fits all' Sacrament, but with proper guidance, most people benefit. There is a way to reclaim your health. Let us show you how. 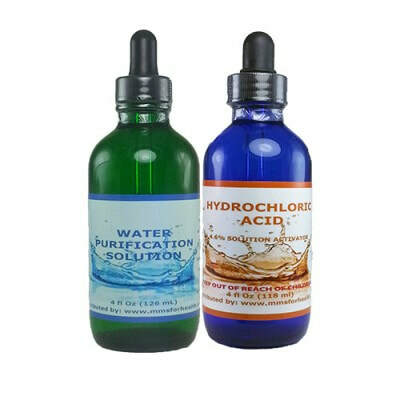 ​We prefer to use the HCL Activator, so Please get the WPS1 + HCL Kit + 1 DMSO. If you can, get more than one Kit while they have supplies. ​We're a Group of CD Practitioners for Informed Health Choice. As Practitioners of Health & Healing, we use CD Protocols as Sacraments, to achieve mind and body wellness. Our group is very private and you will need to be invited, as the group is not visible to join via the internet. You must be recommended by a current member or invited by the Admin, to become a member. We offer healing support via 1:1 coaching and via a Private Facebook Group. We link you with our CD Protocols & Sacraments Coach to help you navigate your way to healing. Our group is super private and no one except members, can see your posts. We offer Personal Coaching Portals where you receive individualized coaching. But you are also able to interact with other group members and learn from their situations. ALL new members are vetted for compatibility and seriousness toward personal, individualized healing. With CD, one size does NOT fit all and CD Sacraments are not for everyone. So while we'll vet you form compatibility, we won't try to convince you to join us. Don't be surprised to see that we are a different type of support group. Yes, we do offer REAL support. It's NOT a social club. We truly help real people who are suffering with Diseases and other illnesses. 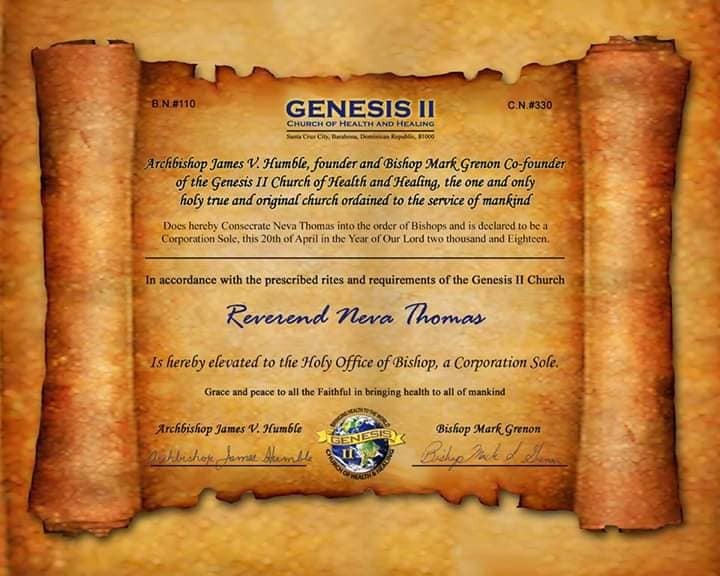 We use CD Sacraments for health and healing and operate under the protection of the Genesis II Church of Health & Healing, Chapter #330. This is strictly about Health & Healing with Informed Choice. You keep your current religious affiliations, if you have any and know that we are NOT a religious group. How you worship is your business. However we are Christians and express our faith openly. We use the protection given to churches to practice using our MMS/CD Sacraments, without government interference and mandates. We're Legal! 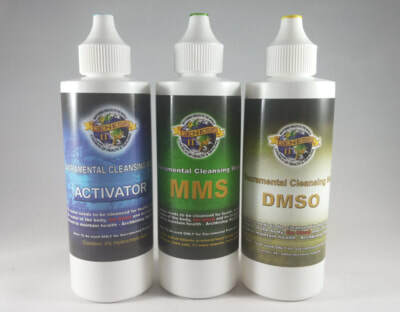 If you would like to learn how to use MMS/Chlorine Dioxide (CD) to help your body heal and to support your family's healing journey, Under the Expert Guidance of Bishop Neva Thomas, You can message me on FaceBook or send me an Email.. Membership to the group is exclusive and has a recurring monthly subscription requirement. This is like a subscription so you can stop and leave whenever you want to. Members find this so much more affordable, compared to the cost of normal 1:1 coaching. People are usually surprised at the value they receive for just a monthly donation. Why? It's not about the money. The subscription helps to keep it real. I give you my time and expertise, and you use my time and expertise wisely. Your subscriptions ensures that you do not waste your time or mine. Got it? ​If you're accepted after vetting, you will be advised how to set up your Recurring Monthly Subscription, and how much it will be. It's reasonable, as we know some of you have already been bankrupted by the current medical system. We look forward to helping you use CD protocols and Sacraments to restore your health and wellness. Blessings With ​Health & Wellness Integrity to You. 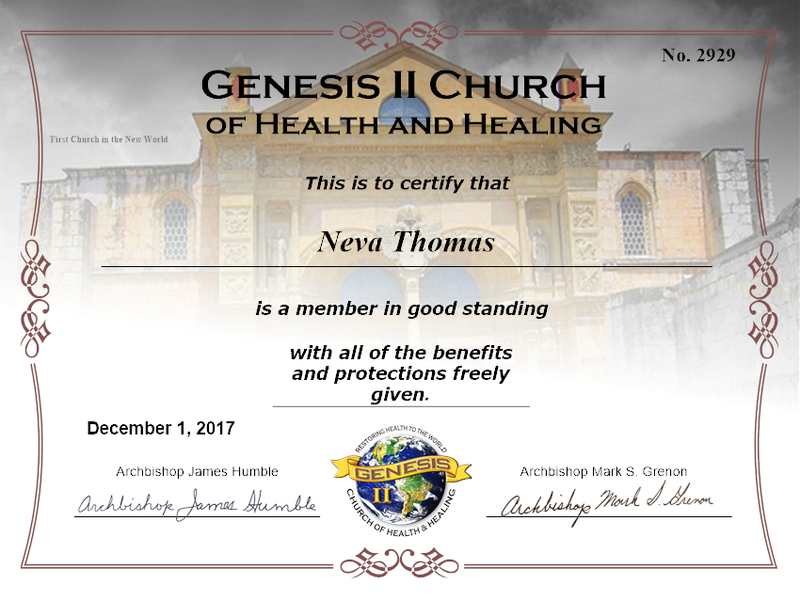 Certified Health Minister of The Genesis II Church of Health & Healing. Ready for Uncompromising, Health & Healing Support? Those who wish to use MMS/CD to enhance their healing, has expert guidance. We know how to hold your hand and guide you, ​without the drama and fear. job is to guide you with your CD Protocols and Sacraments. ​Click the drop down menu and select your Monthly Subscription level. You can leave the group and cancel, anytime you wish. DISCLAIMER: The information provided in these videos or the website, or through linkages to other sites, is not a substitute for medical or professional care, and you should not use the information in place of a visit, call consultation or the advice of your physician or other healthcare provider. The JA Health Advocate is not liable or responsible for any advice, course of treatment, diagnosis or any other information, services or product you obtain through these videos or the website. Individual health and healing outcomes may vary depending on circumstances that only you can control. 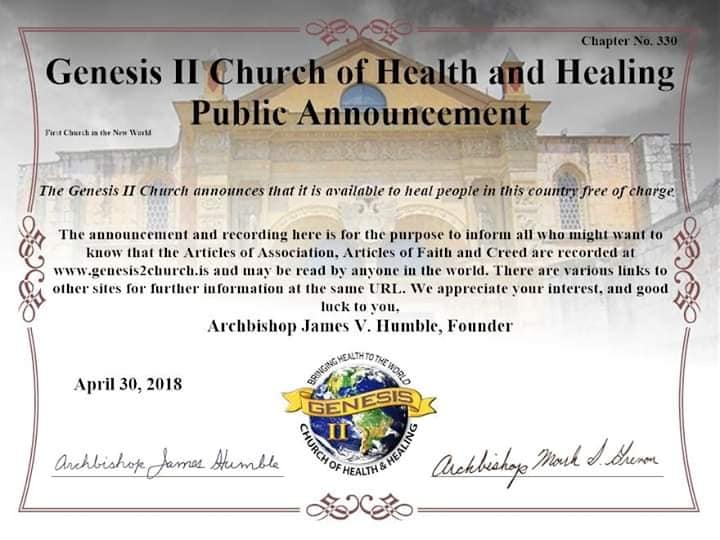 The protocols described on this page are official sacraments of the Genesis II Church of Health and Healing. The reader accepts 100% responsibility for any and all use made of any information herein. You can share your Personal CD Group Testimonial in the comments below.